Sail and Oar boats are built traditionally from solid timber. We start with trees; felled and cleft or sawn before drying. 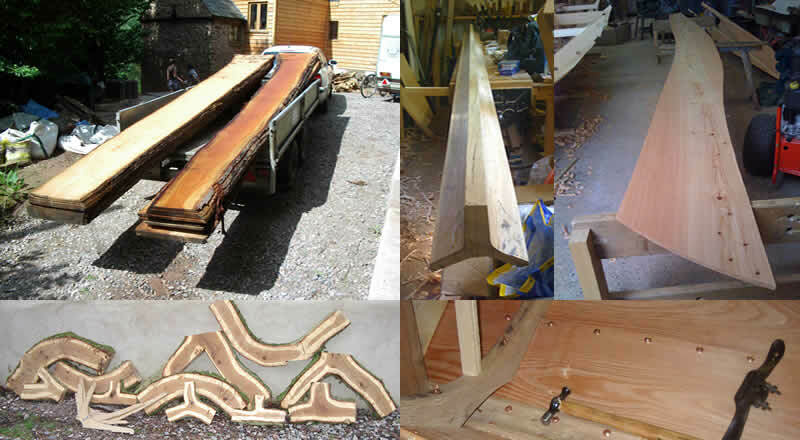 Oak is usually worked green; a keel will be cleft with axe and wedges then adzed to shape, frames will be selected from branches having the proper curve. A faering is built from the keel up, riveting the larch strakes to each other as they overlap using clenched copper nails. Only after the hull is almost complete are the frames added and this technique results in a flexible hull which moves with the water, rather than the rigid and heavy construction traditional in Britain. The traditional construction is strong and durable and a faering will greatly outlast a plywood dinghy and probably a fibreglass one as well. These are not highly polished ‘gentlemen’s leisure craft’ coated with layers of glassy varnish and decorated with brass fittings, they are working boats which bear the marks of axe and chisel; fittings, such as they are, are of iron or whittled wood from the hedgerow. The perfect balance between a rowing boat and a sailing boat, the faering is so-called because it has four oars (larger boats such as sexaerings and attrings are possible as well) and though local types have evolved over more than a thousand years, the fundamental design has hardly changed in that time. The oars are unusual in being supported by Keips or thole pins of oak with a rope humlaband to hold them in place; this makes for very steady, relaxing rowing. The keips are attached to the hull with trenails - tapered and wedged oak rivets. As slender, double-ended craft faerings row fast and easily and slip beautifully through the water under a modest sail area. The mast can be raised or dropped in less than five minutes; even when it is up, one pair of oars can be used which makes the boat very versatile in confined waters. The narrow hull can seem tender (tippy) but is very hard to capsize and stability is greatly increased by the traditional method of putting some large rocks in the bottom as ballast. The distinctive assymetric tiller system of a faering is a direct relic of the steering oar they originally used and though it takes a little getting used to it has some real advantages. A faering 18’ long and 5’ in breadth will carry a family of four easily and will manage six adults in calm waters. It is quite possible to add buoyancy in the form of fenders lashed down to the frames, or plywood lockers; even a traditional Viking GPS holder can be useful… Faerings were normally kept out of the water when not in use and thought has to be given to how wet the timber becomes, but two or three weeks in the water may be quite all right if the boat is looked after. Faerings with a traditional finish of linseed oil and stockholm tar, or Varnol (a modern version of the same thing) need very little work to keep them in good order, just a wash down and another coat or two each season and the boat grows in character as the patina develops. 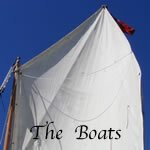 A faering sails differently to a modern dinghy but it doesn’t take long to adapt. The spritsail rig is very safe, having no boom, and can be furled by pulling a brailing line which removes power in seconds. Having a full-length keel rather than a centreboard means you need to back the foresail when going about but she’ll steer beautifully, make surprisingly little leeway and will happily sail in less than 18” of water. If the wind dies, just drop the mast and row; you’ll have none of the frustration of trying to return to shore using inadequate paddles and can continue to enjoy the day. We will gladly arrange to give you some lessons when your faering is new to you.